The telecommunication industry has witnessed major changes in the past two decades going from fixed line communication and circuit switches going through optical fibres, data exchange, the internet, packet switches, radio frequencies and satellite usage to the current mobile wireless world. It is believed that no other industry has ever experienced such an amount of emerging, conflicting and complementing technologies in such a short period of time. Starter companies have become giants in the telecom industry and old empires have collapsed in this insatiable quest for market share, better services and faster integration of the seven corners of the globe. Communication became the sharing of every bits and pieces of life from anyone, anywhere, anytime to everyone no matter where or when. The mobile telecommunication and its wireless infrastructure have proven to be the most democratic technology ever, becoming even more affordable and accessible to individuals then the old Graham Bell invention – the telephone. Cellular phones became drenched in every business, part of life of individuals and frenzy for teenagers. From simple voice to real time video feeds, people became ubiquitous. Wireless communication had an evolution of its own following different operating systems, platforms, technologies and handheld devices. This evolution is better known as generations. The first generation or 1G was based on AMPS technology and had its early start in the 1980’s. In the beginning of the 1990’s a quest for better capacity and coverage drove the second generation (2G) using TDMA, GSM, GPRS AND CDMA. Then the quest for data transfer and higher speed in the late 1990’s and beginning of this century made the third generation (3G) a reality through EDGE, UMTS and CDMA 2000. Moving towards the 4G, expecting broadband wireless services, the telecom world speaks of WiMAX and OFDM. However, by the end of last year (2006) HSPDA started being deployed. The 4G is here and now. This report limits itself to provide an overview of the third generation of wireless communication, more specifically the deployment of WCDMA/UMTS in the global market, going from the marketing definition and segmentation to the key players and the consumers of such technology. In the end, a brief analysis of the next generation and the probable technologies is drawn, highlighting the most significant weaknesses and strengths of the promising 4G. The approach taken focuses mainly in the marketing perspective with some limited outlines of the technology. 3G stands for Third Generation of developments in wireless technology, in particular mobile communications. As its name suggests, Third Generation (3G) follows the first generation (1G) and second generation (2G) in wireless communications. 3G is also known as W-CDMA, UMTS, CDMA2000 or EDGE depending on the region deployed. 3G/UMTS technologies utilize a 5 MHz channel carrier width to deliver greater data rate and increased capacity compared with 2G networks. 3G main capabilities include enhanced delivery multimedia features such as remote control, voice, data, and video. These features are easily integrated with cellular telephone, e-mail, paging, fax, videoconferencing, and internet. Due to its large-scale interoperability and roaming capabilities, 3G/UMTS permits users to be interconnected 24/7 worldwide. The overall market for 3G/UMTS technologies in the world is estimated at $ 2.9515 billion in 2007 according to data from Portio Research, a worldwide provider of technology analysis and market research. The market is expected to grow by 2011 at a 50% compound annual growth rate (CAGR). By 2011, 3G/UMTS technologies revenue will reach $ 3.964 billion approximately. 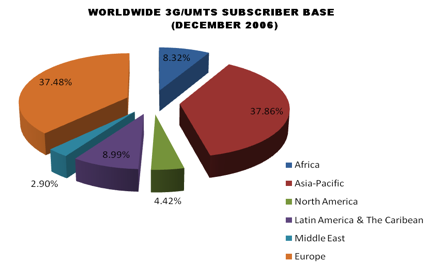 The number of subscribers worldwide to December 2006 was approximately 2,102 million. The following table represents the subscribers break down per region. 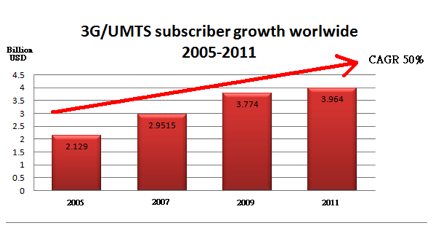 Figure 2 shows the world total 3G/UMTS mobile subscriber base as of December 2006. Asian and pacific countries (APAC) accounts for over 37.86% of the global 3G/UMTS market, Europe meanwhile contributes with the 37.48% to the global 3G/UMTS base. Latin America and The Caribbean contributes with an 8.99% whereas North America makes up 4.42% of the global 3G/UMTS marketplace. Africa and the Middle East are emerging market for the 3G/UMTS technologies, both markets account for over 11.22% of the global 3G marketplace. In European and Asian countries 3G/UMTS technologies have been readily available for many years; the market growth in units has pretty much been in line with the population growth. As the market for 3G/UMTS continues to mature, buyers have become increasingly discerning and increasingly aware of and interested in the key feature/benefit differences from one competitor’s offering to the next. As a result many, but no all, mobile subscribers are placing much added importance on features and performance, and how well the 3G offerings appears to serve their needs, and are placing less emphasis on price. It is noteworthy to mention that in North America, the 3G/UMTS market is smooth and is likely to decline in future years as more and more users will tend to substitute these technologies with WiMAX. According to the worldwide mobile market forecast 2006-2011 report, it is expected that North American mobile subscribers will spend more than $ 75 USD million on 3G handsets and services by the end of 2011. Although The United States does not lead the world in 3G, the country is emerging as an enormous market for the deployment of such technologies. Because the market for 3G/UMTS offerings is expanding, it is difficult to draw exact boundaries on the size of the potential market. According to industry analysts, 2007 will be year of market’s consolidation; it is worth to point out that this consolidation will be driven by private subscribers, not businesses. Spending on 3G/UMTS technologies will continue to hold its own. The 3G/UMTS market is primarily segmented by the technology deployed as well as the services provided. This market is segmented into WCDMA NETWORK OPERATORS, HSDPA NETWORK OPERATORS, ENHANCED GSM/EDGE and COMBINED WCDMA & GSM/EDGE according to Association Global mobile Suppliers (GSA) []. However WCDMA 2000 and FOMA also must be mentioned. Over 146 commercial networks deployed worldwide. The fastest growing segment in Africa, Europe and the Middle East. Location-based services, m-commerce, m-learning, real time content provision, video calling, rich voice, 3D multimedia animations and games will also be killer applications that generate revenue for constructors, and operators in this arena. In terms of tools and functionality, the increase of competitive activity within the mobile industry has created a hustle to fill new niches, and an immense need to differentiate. The 3G/UMTS market has become so commoditized that nowadays is difficult to differentiate one Telco from another in terms of what they offer, since their offerings are similar, so that the only way for vendors to compete is price. Due to this lack of differentiation, prices in this arena are going down. In order to countermeasure these price decline, mobile carriers, application developers and device vendors have commenced to expand their product and services portfolios by developing and commercializing “Bundle packages” including video telephony, PoC, Multimedia Broadcasting, multimedia messaging, video streaming and interactive gaming. CAPACITY With the introduction of High Speed Packet Access (HSPA), mobile manufacturers, constructors, content providers and NVO expect to deliver advanced mobile multimedia services with user throughputs of 800 kbps to 3.0 Mbps. Subscribers also expect that mobile manufacturers enhanced their handsets by adding capacity for voice service. GREATER ROAMING CAPABILITIES Subscribers want an extended broadband wireless connectivity which allows them to enjoy high-speed net access virtually everywhere they go. DELIVERY, INTEGRATION AND ENRICHMENT OF CONTENT Content designers will focus on media-enrich and creative content approaches by making use of mobile devices to deliver content to subscribers. COLLABORATION Collaboration will drive content creation and accelerate content development. Innovations from outside the industry will create new business models-think. VOICE INTEGRATION As bandwidth, video, and voice technology continue to improve, the demand for enhanced 3G/UMTS products and services will grow exponentially. Commercial networks as well as subscribers want to know how 3G applications can help them improve their ROI on products, or help achieve their company’s business objectives. Subscribers demand unlimited flat rate access price plans which help them to increase their ROI as well. Historically, the 3G/UMTS industry has been highly lucrative with high margins, below average competition, steadily rising sales, and a solid financial performance. What have limited entrance to this industry are the significant investment requirements in infrastructure, fierce competition from other high-speed wireless technologies such as WiMAX as well as the difficulty of satisfying customers regarding new capabilities. This industry can also be characterized as hyper-competitive. There are many mobile phone manufacturers, Mobile Virtual Network Operators, branded content providers and mobile operators that are competing more or less for the same customers. Competing companies of 3G/UMTS products and services are highly similar, yet, without a clear difference from one to the next. Lack of differentiation characterizes this industry; therefore prices in this market have dropped away. Consumers no longer perceive significant quality distinctions among the largest providers. As a consequence vendors have been forced to start pricing aggressively in order to maintain and gain market share. Industry analysts believe that in order to succeed vendors must adjust or reinvent their value proposition. The following depicts variables to keep in mind when reinventing value proposition for the 3G/UMTS market. The next-generation 3G/UMTS will need to be able to “talk to” and exchange data seamlessly with other devices. The main goal of 3G/UMTS service providers is to provide unlimited voice access to their clientele without even saturating their existing bandwidth. Competition in the 3G/UMTS focuses on technology. Firms invest great effort in striving for technical advances over their competition. Marketing tends to emphasize technical differences. It is important to point out that some companies in this marketplace focus their competitive energies in many different ways. Some firms for example, give their primary competitive focus to supplying data and voice services. Other firms have focused exclusively on satisfying consumers or businesses needs whereas other mobile providers have extended their portfolios by offerings services depending on geographical reach or coverage in specific regions. Infrastructure providers – companies that invest heavily on R&D and as a consequence develop and sell all the infrastructure and equipments necessary for the diverging wireless networks. Operators – enterprises that own or lease the networks and provide the mobile service to end consumers under their brand names, such as Bell, T-mobile and singular. Handset manufacturers – those that manufacture the devices that make the communication possible in the existing infrastructure. Some of these manufacturers are also infrastructure providers. E.g. : Nokia and Ericsson. Users/consumers – Are the subscribers to the services that the operators make available. The owners of the handset devices being it individuals or enterprises. For a clearer picture of this complex scenario the key players shown below are with regards to the infrastructure providers only and they are shown in five categories: Leaders, challengers, visionaries, niche players and emerging players. We have deepened in the leaders of the market due to their importance, and in the emerging player since its fast growth in the past year. * Merger of Alcatel and Lucent Technologies in December 2006. No data is yet available. Core Business Ericsson is the leading communications supplier, provides communication solutions, mobility solutions and terminals. Technologies GSM, GPRS, EDGE and WAP, as well as UMTS and WCDMA. WirelessTechnologies GSM, GPRS, WAP, MIA and UMTS. Core Business Mobile phones, multimedia, enterprise solutions and networks. Optical networks, phones, security and VPN, VOIP and multimedia communications, and wireless networks. It is important to note that although the figures for 2006 have not yet been released, Huawei Technologies will appear amongst the top 3G infrastructure providers since it now serves 31 of the top 50 operators around the globe[]. That will cause an absolute swift in the global market share scenario. As for the current UMTS their major advantage is the fact that its core network is as close as possible to the GSM network which means that it can be develop in countries with existing GSM networks. On the other hand a whole new radio network access has to be built as it does not use current GSM frequencies and such licenses can be rather costly. HSPDA is a very low-cost deployment because it uses the same 5 MHz channel carrier as UMTS networks and they can co-exist since HSDPA refers to the access network. The only necessary change is in terms of a software upgrade on the base stations. HSPDA throughput can reach 14 Mbps and its transmission can cover kilometres allowing connectivity to be retained by mobile users. Its downside is the fact that the spectrum is licensed and that the deployment cost can be high for countries / operators that do not have a UMTS network. WiMAX, although it is still under development, promises to provide the full mobility of cellular networks and broadband speed. There is no global license spectrum for WiMAX but will probably use channel carrier of 5 to 7 MHz. Its throughput is expected to be of 70 Mbps, the coverage of up to 48km permitting users to always be connected and its spectrum can be exempt from license. The two major drawbacks for WiMAX is that it works in multiple frequencies requiring more complex handsets to be compatible worldwide and the uncertainty of which network suppliers are willing to deploy it. Due to the device driven approach, organizations have started to implement and upgrade mobility technologies to boost employee’s satisfaction, productivity and efficiency. By deploying such applications, companies are gaining a valuable competitive advantage. With the introduction of more electronic gadgets and tools capable of delivering content anywhere at anytime , companies have begun experiencing new methods of delivering content such as audio, pod casting , video casting, playstation portable (PSP) and other applications. In order to keep pace with the industry, mobile operators, MVNO’s , content providers and other players within the 3G value chain will have to consider the role of complementary technologies such as Wi-Fi, WiMAX, MIMO and future enhancements to 3G/UMTS a part of their overall services proposition to customers. Interest for reliable, fast services has driven the telecommunication industry towards the development and deployment of new technologies world wide. There is no specific standard for the players in this industries and different demographics quest for different solutions and whether this technologies will blend into one or new ones will arise is still uncertain. The bottom line for the future, however, seems to just one, the seamless integration of wire line and wireless communication infrastructure to provide fast, real-time ubiquitous access to information in whatever form is or will be available. 3G Evolution with WCDMA-HSDPA and GSM/EDGE for New Era of Mobile Broadband. [Online] / Auth. Association Global mobile Suppliers. – January 31, 2007. – January 28, 2007. – http://www.gsacom.com/downloads/pdf/GSM_3G_Market_Update.php4. GSM/3G Market Update [Online] / auth. Association Global mobile Suppliers. – December 10, 2006. – January 28, 2007. – http://www.gsacom.com/downloads/pdf/GSM_3G_Market_Update.php4. 3G Evolution with WCDMA-HSDPA and GSM/EDGE for New Era of Mobile Broadband [Online] / auth. Association Global mobile Suppliers. – January 31, 2007. – January 28, 2007. – http://www.gsacom.com/downloads/pdf/GSM_3G_Market_Update.php4.